For our engagement, Eugene's aunt and uncle gave us this excellent mandoline; a kitchen tool that I've been coveting for quite some time. So long in fact, that the minute I opened the box I knew EXACTLY what I was going to make first. 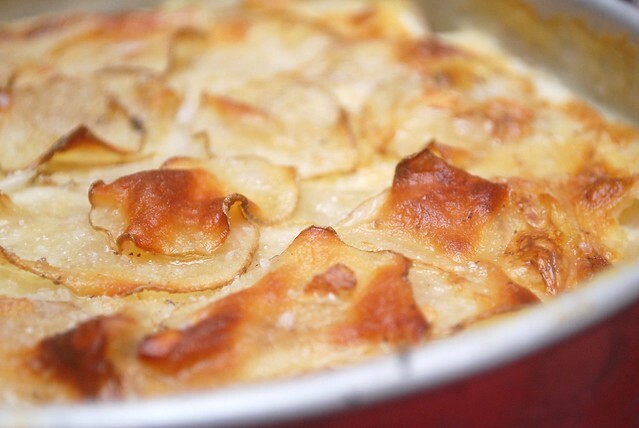 Potatoes au Gratin is one of those classic, spectacular French dishes that sounds terribly complicated, but which in reality is ridiculously--almost embarrassingly--easy. (Similar to the also awesome and also French potage parmentier.) The only caveat being that you really do need a mandoline to get those perfect, paper-thin slices. Not necessarily an elaborate, expensive multi-function mandoline like the one we were given (though if you have a wedding registry to fill or a Christmas list to write, I do highly recommend it! ); a simple $15 model like this will work perfectly and will make this dish that much easier to assemble. I personally love my gratins bare-bones simple with just four ingredients (plus a bit of salt and pepper). Those four would be potatoes, garlic, butter, and cream. At this point you're probably thinking, "No cheese?!" But trust me...you don't need it. You also don't need herbs or breadcrumbs or bacon or any other things to muddy up the deliciousness. This dish is as simple as can get. Just wash and slice up your potatoes at the thinnest level your mandoline will allow (no need to peel!). Butter up a baking dish (they actually make "gratin dishes" just for the purpose of this dish, but you don't need that. I use whatever baking dish is around and clean and looks to be about a reasonable size. Contrary to popular thought, said baking dish doesn't even have to be round! ), and start layering. You want the potato slices to overlap just slightly all the way around (or a-square) on each layer, separating them from the next with a couple crushed garlic cloves, a few pats of thinly sliced butter, and a generous sprinkle of good Kosher or sea salt. Continue to repeat until you've run out of potato, then top with a couple more thin slices of butter, some salt and pepper. This whole thing is placed in a hot (350 degree) oven and baked for about 40 minutes, at which point your home will start to smell like you've placed a dish of bubbling cream and potatoes and garlic in the oven (which, of course is EXACTLY what you've done). That's your reminder to crank up the heat to 400 (a genius move which I'm certain was devised many years ago by an increasingly impatient Frenchman who could wait. no. longer) and let it go another 10 until it is golden and crackly and bubbling on top (if you have a broiler you can pop it under that for a minute for extra crisp on top). Resist, and let it cool for 5 to 10 minutes before giving in. Eugene and I have been known to make an entire dinner of this, eating straight from the baking dish (sometimes served alongside a halfhearted and totally irrelevant salad). The recipe is below for your reference, but know that it's really more of a method than anything else. You can easily double or half this if needed. This also keeps and reheats well so you can save the leftovers for the next day (though it's really best right out of the oven). Butter an 8" round baking dish all along the bottom and sides. Preheat your oven to 350 degrees F.
Set your mandoline to the thinnest level possible and slice your potatoes (skins on) into paper-thin slices. 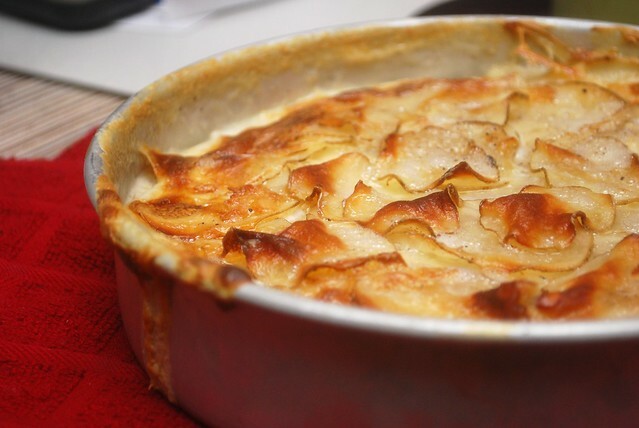 Layer the potato slices with just a light overlap all the way around your baking dish, covering the bottom completely. Scatter with a couple crushed garlic clove halves and a few slices of butter. Season with salt, then repeat with another layer of potato slices and more butter and garlic. Continue to repeat the layers until you use up all the potatoes. Top with a few final slices of butter and a generous sprinkle of salt and freshly ground black pepper. Pour the cream over the dish, making sure it distributes evenly. 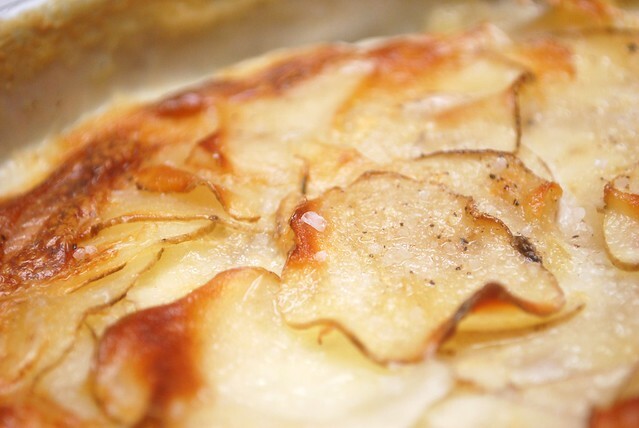 Bake for 40 minutes, then increase the temperature to 400 for an additional 10 minutes or until the top of the dish is golden and the potatoes are crisp at the edges. Remove from the oven and let sit for 5-10 minutes before serving.